We offer the needy children of poor, unskilled Indian migrant workers the opportunity for a better future. Education is the foundation of a better life. Devendra Kandolkar, a true soul of fire, is the backbone of Moving School in Gujarat. He inspires and leads the staff—9 teachers in 2017-18—who educated 340 children. The campus of the Moving School is made up of several semi-permanent classrooms and a few permanent buildings, which offer primary school courses. The hostel for girls opened in early 2014, with five girls enrolled. Traditionally some families did not want girls to live away from their family homes. However, enrolments are increasing, with ten girls and twenty boys in the hostels in 2018. You can support Moving School’s important work in several ways. With your support we can offer more children a better, safer future. With the help of education, they can escape the cycle of poverty. You can donate to Moving School via MobilePay. Since 2001 we have helped more than 17,000 poor Indian children complete primary school. Four of Moving School’s former pupils study at the University of Karnataka. One girl, Kusuma, is now a student at the finest school of engineering in Karnataka. One boy, Maligimani, who studied at the Devsu school back in 2004/2006 is now a well known reporter on ”Daily News” and has interviewed ministers and commonly known personalities. Anders Linnet and Mette Lange, two Danes who had been coming to Goa for many years, worked with local partners to open the first Moving School in Goa, India, in 2001. Their local partners are members of a committee that helps children in distress and share local knowledge. The project addressed children of migrant workers who migrated to the South Indian state of Goa to undertake seasonal unskilled labour. The workers lived in tents on the riverbanks with their families, working on boats dredging sand from the river bed and bringing it ashore to be used for the building industry. Because the workers were only there for part of the year, the Goan government did not take responsibility for educating the children of these families. The first Moving School project including a variety of “campuses,” including: floating schools constructed on river crafts; rolling schools on land; and simple huts rented for the purpose. With only these humble structures as the basic infrastructure, Moving School eventually provided primary schooling to more than 10,000 children. As of 2017, only three campuses with about 70 pupils remain in Goa. This is due to the fact that the Goan government successfully completed an initiative to integrate the children of migrant workers into the local school system. The Moving School has been recognized by the Ministry of Education and is frequently listed as one of the most successful NGOs working in the area of education in Goa. More than 17,000 children of migrant workers have, since 2001, received education through Moving School. Graduates of Moving School have gone on to study at Indian universities. All contributions go directly to run the schools in India. All work in Denmark is done by unpaid volunteers. We educate a child in India for less than 135 Euro a year. This covers student uniforms, infrastructure maintenance, materials, teacher salaries, and other costs related to administering the schools. Besides basic learning, the children participate in games (sport), cultural events drama, theatre, dance etc., on the same level as other school children. In December 2018 MovingSchool got a new partner - TVS Group, a big Indian company. Thanks to friend and Chennai based architect Vineeta Badawe, who has been a MovingSchool ambassador and has created this wonderful contact. Higly appreciated. So the new school year has started - we still look forward to welcome more primary students - they are in their villages waiting to celebrate the Moharam festival the 20th. September. The group FOH - Friends of Humanity - which consists of nine architects from Bangalore, are new contributors to MovingSchool. We hope to obtain a good collaboration in the future, which will also include a physical presence in Gujarat, where we will work jointly on improving the schools. Moving School is a foundation and has a large number of members. Membership fees go directly to funding all of the school’s activities. Various friends of the school have made private donations. Events have been organized in Italy to conduct collections for the schools, and our finish ambassadors - KUMMIT – which means godparents - have supported the schools since 2008. Substantial donations from Rotary have supported the schools for years, and in 2008 Rotary International allowed Moving School to open an IT School in Devsu, Goa. Half of the twelve portable computers are now in Gujarat. Our finish ambassadors Kummit has been a significant part of MovingSchool and has collected large contributions since 2008. Tytti Mäkelä and her husband Esa spends every winther in Goa, and visit the schools, participate in various events and guarantee that contributions from friends and acquaintances in Finland are used properly. Badeklubben has in 2017 donated 15.000 kr to the schools. The architectural office became a partner company over a 3-year period, starting in 2017. Yearly donation is 25.000 kr. 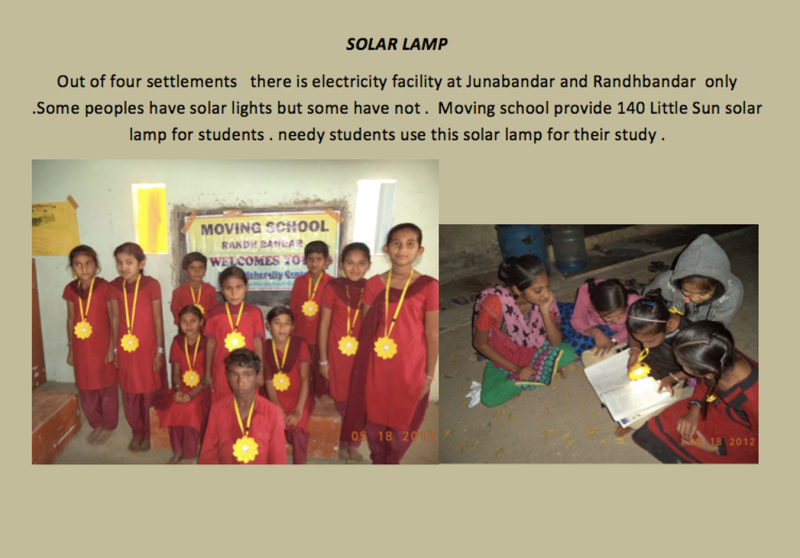 The group consists of nine architects from Bangalore, Indien, who want to support and work for MovingSchool. Yearly donation is 25.000 kr.